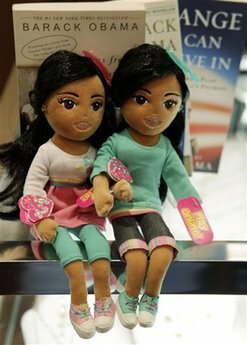 The Oak Brook-based company denies that the dolls were created after the President’s daughters. They say they chose the names because “they are beautiful names,” not because of any resemblance to Malia and Sasha Obama, said spokeswoman Tania Lundeen. The dolls were introduced in early January and a limited supply has been shipped to retailers.